4 Dumbbell Moves to Master | Valet. It's one of the simplest and oldest pieces of equipment—the humble dumbbell. And while we're all familiar with the go-to moves like your basic bicep curl or tricep extension, a pair of dumbbells is good for more than a few arm exercises. The weights can actually provide a full-body workout in a compact amount of space that will shred unwanted fat, sculpt muscle and strengthen your core. Herewith, four essential moves to master. As for the amount of repetitions or sets, we'll let you determine that for yourself based on your personal fitness goals. This is really a lower-body exercise that increases strength and toning throughout the legs. 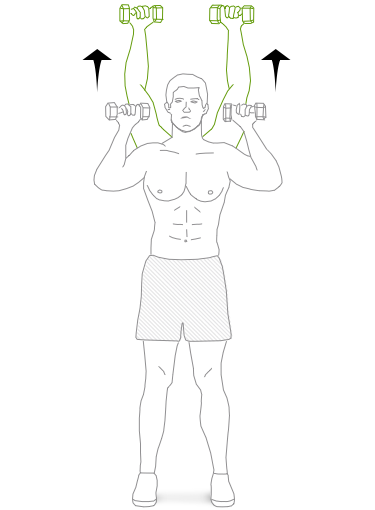 But thanks to the weight's position, it also works the shoulders and strengthens the core while improving posture. 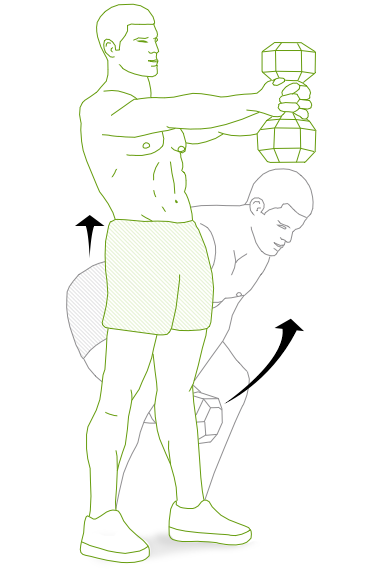 Hold a dumbbell vertically at chest height, cupping the top end with both hands. 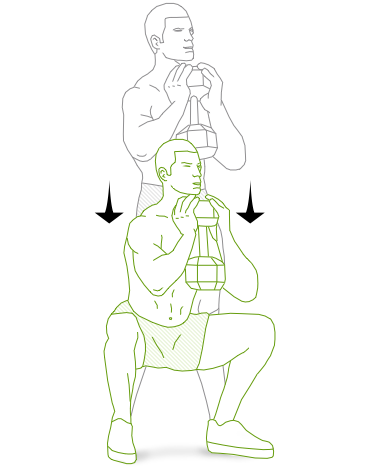 Lower your hips, bending at the knees keeping your back straight (assuming the squat position). Hold for a second, then push back up to the start position. This power move works the core, shoulders, upper back, biceps and triceps. And thanks to the positioning, it also forces the body to use the stabilizing muscles of the core, which tones your abs and promotes good posture. Assume the push-up position with the feet shoulder-width apart, gripping a dumbbell in each hand. Keeping your back flat, pull the right dumbbell up towards your torso, elbow tucked close to you side. Control the dumbbell back to the ground, and repeat on the left side. An old school move, the dumbbell swing engages most of the muscles along the posterior chain—from your calves and hamstrings all the way to your trapezius (that large V-shaped area between your shoulder blades). Hold a dumbbell with both hands with your arms extended. Bend at the waist, rocking back slightly and "hike" the dumbbell between your legs. Then thrust your hips forward forcefully, swinging the weight up to shoulder height. Reverse the movement, so that you swing the dumbbell between your legs again. Allow momentum to swing the weight—you're not trying to actively lift it with your arms. The shoulder press targets your shoulder's deltoid muscles, along with the triceps and pecs. And research now shows that standing dumbbell presses are more effective than when you're seated. Because when you lift while standing, you force the body to stabilize, which (bonus!) engages the abdominal muscles as well. Seven popular workout myths and the truth and science behind them.